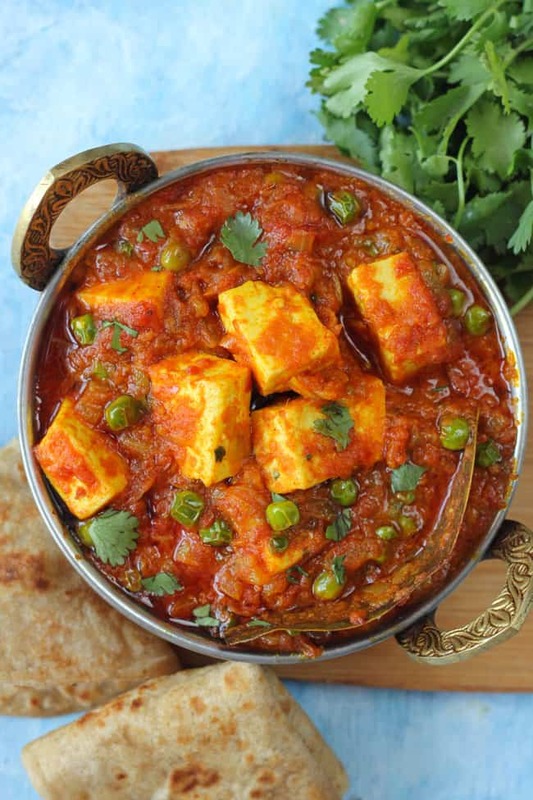 Dhaba Style Matar Paneer is a delicious Indian curry loaded with dhaba and restaurant like flavors. It is perfect with tandoori roti. This decadent looking matar paneer is 100% gluten-free and vegetarian.In this recipe video, I have shared all the secrets to making a perfect Dhaba Style Matar Paneer at home. 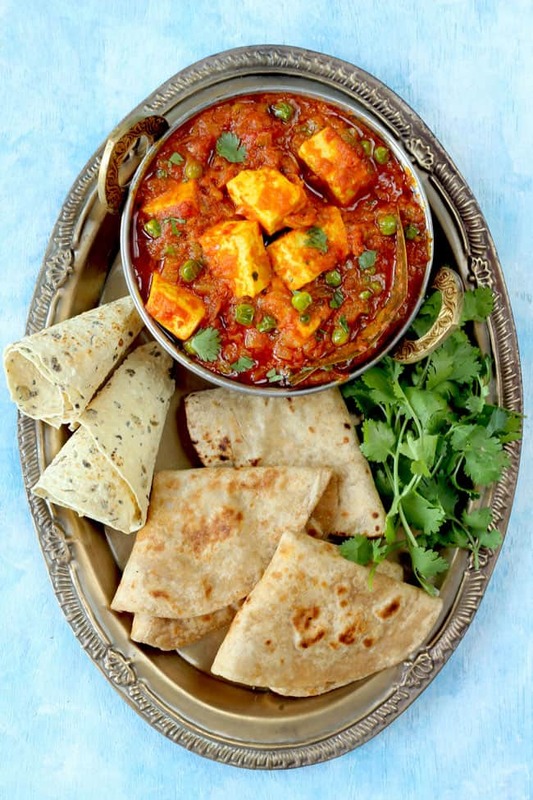 Though this is a bit time-consuming matar paneer recipe but a simple one to follow. There are no complicated steps involved. All you need to do is fry the masala nicely and cook it to the perfection. That’s it! 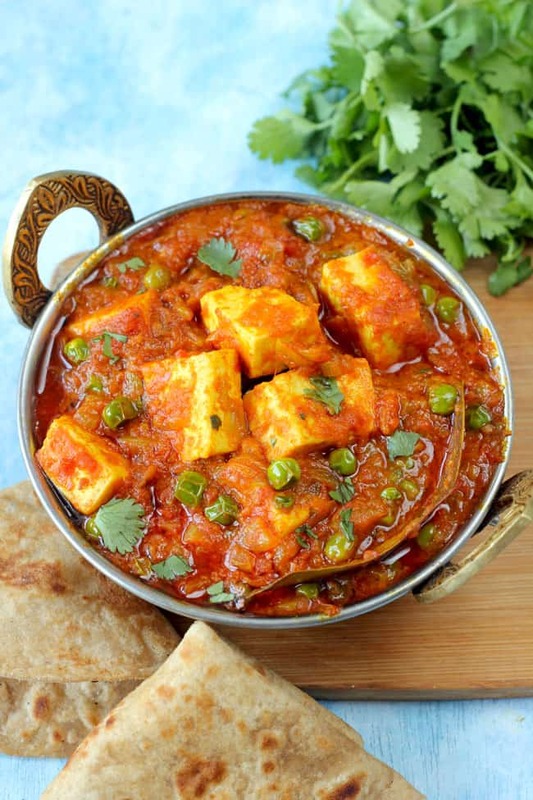 And you have the most delicious restaurant style matar paneer cooked at home with few basic ingredients. One of the simplest of all Indian curries also happens to be one of the most popular across various restaurants all over the country. 1) Use best available ripe and red tomatoes for the gravy. They give a great taste and color to the dish. 2) Stick to either Kashmiri red chili powder or Deggi Mirch Powder for this recipe. These two are known for imparting a rich color to the dishes. 3) Adding roasted gram flour thickens the curry and gives it restaurant like consistency. 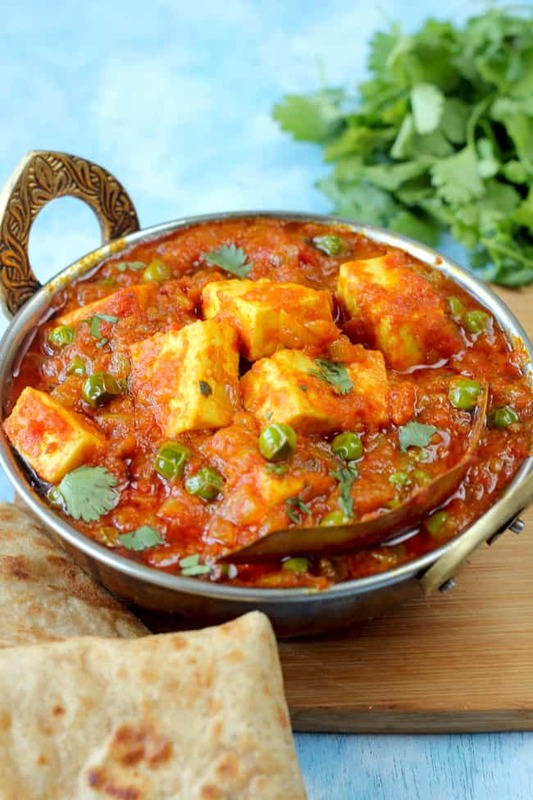 But only a tablespoon or so is sufficient to make a perfect matar paneer. 4) Mustard oil or ghee is the ideal to make any dhaba style rich gravy. I have used mustard oil in this recipe. 5) Frying paneer for the gravy is totally optional. May people like fried cubes of cottage cheese in their gravy but I prefer just the opposite. And I don’t think frying paneer contributes to the taste or texture of the dish. 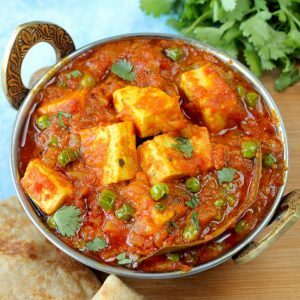 Dhaba Style Matar Paneer is a delicious Indian curry loaded with dhaba and restaurant like flavors. Make paste of tomato in mixer. Set aside. Dry roast the gram flour over low heat till aromatic and golden. Keep aside. Heat mustard oil in a kadhai till it starts smoking. Reduce the heat to low. Fry the paneer cubes till they turn crisp and golden from both the sides. Transfer to a plate and set aside till required. This step is completely optional. Add bay leaf and fry for a second. Next add the chopped onion and cook till onion are golden brown. Add the ginger and garlic paste. Fry nicely for 3 - 5 minutes. Now add the tomato paste. Fry till the masala starts leaving the sides of the pan. This might take 5 - 10 minutes. Dissolve red chilli powder in two tablespoon of water and it to the masala. Add turmeric powder, peas, roasted gram flour and coriander powder. Stir to combine. Add approximately 1 Cup of water, cover the pan and allow the curry to simmer over low heat for 10 minutes. Next, add the paneer cubes, garam masala, green chilli, salt and mix nicely. Simmer the curry for few 5 more minutes or till it thickens. Garnish dhaba style matar paneer with fresh coriander leaves. 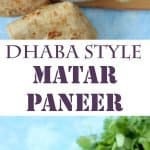 Serve Dhaba Style Matar Paneer with phulka or basmati rice. Frying paneer is totally optional. Adding gram flour gives nice texture and taste to the paneer. Dissolving red chilli powder in water before adding to the masala gives nice color to the curry. Will definitely try to read it 🙂 Thank you for stopping by and sharing your thoughts with us.